Once again, if there were any doubts about Boston University lacrosse, many of those should be put to rest. The Terriers hit the road to reopen conference play on Saturday and came away with a 16-6 victory over the 1-7 Lafayette Leopards. Freshman James Burr matched his career high four goals to lead the Terriers, while fellow freshman Michael Laviano, Brendan Homire, Tristian Ruh, and Michael Carbone also found the back of the net. It was the first collegiate goal for Laviano. 11 different Terriers were able to contribute goals, including two from Jack Wilson, and singles from Pat Myers, Adam Schaal, Cal Dearth, and Ryan Johnston. Allen Winkoff also got on the board with an assist. Kevin Lewis put up half of the point production for the Leopards with three goals, and three different goaltenders made appearances. Jonathan Anastos was the most productive with six saves on the afternoon. Christian Carson-Banister had played every moment of the season between the pipes for BU, and he made two saves before Colin MacDougall made his NCAA debut and added four. Sean McGovern also entered the game, though he did not face a shot. At the half, BU already led 9-1 as the Terriers played at the most dominant they had all season. Sam Talkow, who went 8-for-10 from the faceoff X, was able to rest as Elliott Burr went 10-for-11 when he entered the game. The Terriers put 43 shots on the board compared to just 19 from the Leopards. 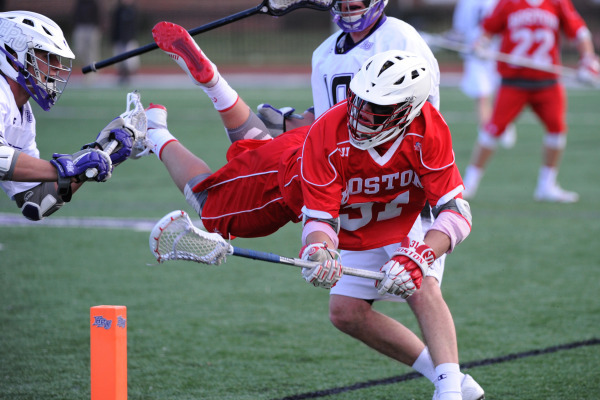 The terriers dominated in every statistical category, picking up 50 ground balls to 27 and winning 21 faceoffs to 5. Lafayette was able to score on 3-of-5 extra man opportunities for half of their tallies. BU is projected to get back into the national conversation this week after an earlier week victory against Harvard, and next week will return to Nickerson Field from its three game road trip to face the Lehigh Mountain Hawks.